Rarely does a book come into my life and across my desk that I just can’t put down. This is one of them and I highly recommend you get a copy and read it. Chafets did a masterful job in writing this book. I have been listening to Rush Limbaugh since 2000. Being a political blogger, Rush has kept me sane, optimistic and motivated even when the going got tough. Always the scrapper, Rush Limbaugh gave me the strength to go on many times when I did not want to and has given me more real news than anyone in the mainstream media. He’s blunt, brilliant, articulate, courageous and honest. I am sure I feel just like most of America when I say that Rush feels like family. Though this is an ‘unauthorized’ biography, you can tell that it is cemented in truth and it is captivating. The book takes you from Rush’s boyhood into present day and does so with humor and aplomb – by inviting you into Rush’s life and by showing you that he is just like any one of us – just more intensely so… You’ll share his struggles, his victories, his defeats and his battles. His journey is the American journey and one that is the adventure of a lifetime. Hard work, dedication and the habit of picking himself up again and again has made Limbaugh hugely successful and voraciously hated by the progressive left. In my book, that damn near makes him a saint. Rush knows that given a chance, the current regime will destroy him and take him down one way or the other. And it won’t just be Rush and Beck, they are coming after the bloggers too. And soon… We are just too dangerous to be allowed to exercise free speech and stand up to our government masters. Rush will be there to lead and guide as long as he can and America will always turn to him. He is beloved and has forever earned a place in our hearts. 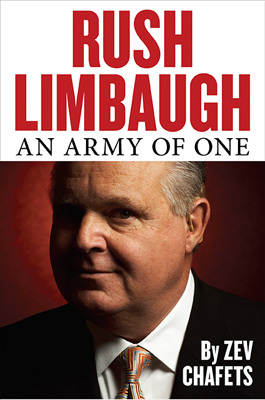 This book goes into many of the real beliefs that Limbaugh has. He is hugely misunderstood by liberals and many times, deliberately so. Rush is not a racist and he is not homophobic. He admires women, but is not a sexist. He is definitely not an anti-semite. He may be wealthy, but he is generous to a fault. He’s a kind and good man who stands up for what is right, just as his father and grandfather did before him. Read this book and you will gain an insight into the man behind the persona. Limbaugh will be the driving force behind the 2010 and 2012 elections. He can pull conservatives together as no other can in this country and Ronald Reagan was right to call him the most dangerous man in America. To liberals and Obama he is the ultimate adversary and rightly so. To America and conservatives in general, he is a lovable fuzz ball who brightens our lives with hope and humor. Rush is a gentleman who does not stoop to calling other talk show hosts names or disparages others without valid cause. I personally, have never heard him be rude and he has far more patience than I do. I love his show, because I love listening to him. Limbaugh says that all we need is the Constitution and the Bill of Rights. He’s absolutely right as always. We don’t need change – we don’t need to fix what was perfect in its inception. Go back to what works and don’t try and ‘fix’ what isn’t broken. This book is simply one of the best biographies I have ever read. Here’s to Zev Chafets – can’t wait to read your next book! This entry was posted in Authors, History, Politics, Terresa Monroe-Hamilton. Bookmark the permalink. This is the best book review I’ve ever read. Awesome!! Can’t wait to get Zev’s book!